Robin teams up with California fingerstylist Steve Baughman, “one of the best Celtic fingerstylists in the country” (Dirty Linen Magazine), for treasures from the Irish, Welsh and Breton musical traditions, as well as five compositions of Ireland's legendary harper Turlough O'Carolan, all brought to life by the rich and soulful sound of two acoustic guitars. WINNER OF THREE “EDITOR'S PICK” AWARDS FROM ACOUSTIC GUITAR MAGAZINE AS ONE OF THE TOP TEN CDS OF 2003! 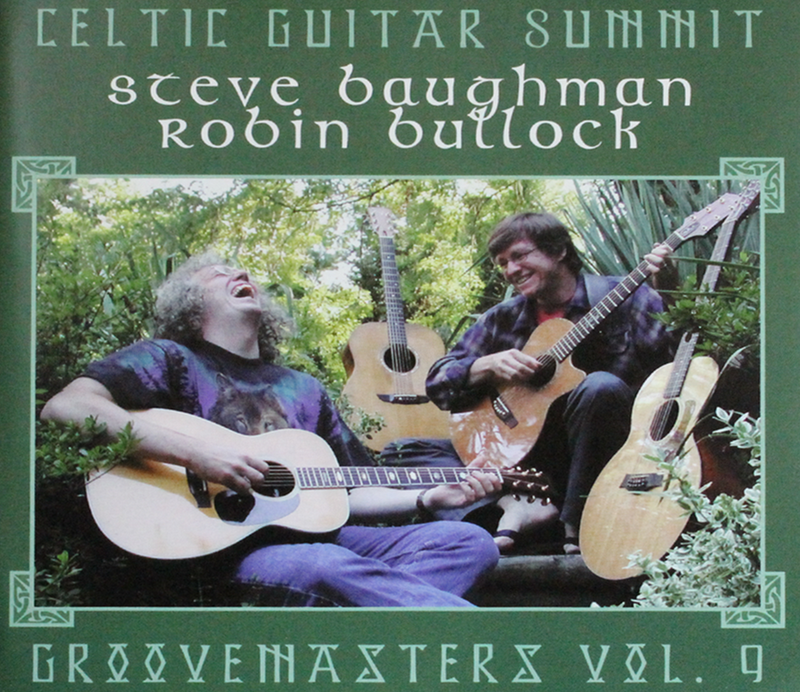 For reasons unknown to me, the Celtic music community has only timidly explored the idiom of guitar duets. The gorgeous sound of two guitars, when presented at all, has been largely hidden behind vocals or other instrumentation. Then along came Steve Baughman and Robin Bullock who have forged a new path and created a musical statement so strong that it will set a new standard for others to follow. But this album is remarkable not only for its bold venture into a new idiom. Simply put, it is also the loveliest guitar album I have heard. What the listener hears is a waterfall of cascading arpeggios and intricate guitar passages emanating from 10 fingers and 12 guitar strings, seemingly one musician with four hands and a guitar of enormous depth of sound. Also intriguing is the carefully chosen material. Baughman and Bullock have clearly left the beaten path in seeking tunes to present. Turlough O’Carolan’s Lady Blayney and Captain Sudley are highly obscure. I am aware of no guitar recordings of these tunes. But in Steve and Robin’s hands they are melodic gems left too long on the shelf. The inclusion of an obscure Welsh pipe tune and Breton waltz are further illustrations of their ability to unearth musical jewels. The few old standards included here take on a new character as the players toy with rhythm and stretch the pieces outside the box. Celtic Guitar Summit indeed, an awakening to other guitarists who play Celtic music. This is the template for a new genre, the Celtic guitar duet. It was a balmy Appalachian night in July of 2000. I sat playing my guitar under the stars at a small college in the hills near Asheville, North Carolina, when someone approached. He introduced himself, pulled out a guitar and sat down. We began to play. The moment the notes from our instruments met in the thick summer air I knew that this was to be no ordinary session. Robin’s playing brought out the best in mine and I found myself suddenly enveloped by sounds I had long wanted to hear. This album is the first fruits of the spark that began that evening. Robin shares my love for the music of Turlough O’Carolan and my belief that much work remains to be done in arranging his pieces for the guitar. We also share a respect for traditional Celtic music and a commitment to giving it voice through the guitar. In August of 2002 we pulled five long, music packed, fun filled days and nights in the recording studio under the expert care of master guitarist and engineer Al Petteway in Takoma Park, Maryland. We are honored to share with you the sounds that fell from our fingers during that joyful week. Italian guitarist Beppe Gambetta says that when two musicians meet, they should celebrate the meeting by playing a tune together. So it was that when I met Steve Baughman, we sat down for a tune or two…and proceeded to play nonstop for three or four hours. There’s a mysterious synergy that happens occasionally between musicians, and you never know when or with whom it’s going to strike, but when it does, it’s like effortlessly riding the wildest rapids with a long-lost twin you never knew you had. Playing with Steve gave me that transcendent rush, and as if that weren’t enough he quickly became one of my best friends as well. Ever since then, he and I have wanted to document and share with others the magic we experience when we play together. Living nine time zones apart complicated matters slightly, but we finally got the chance, and five days and nights at Al and Amy’s cottage later, here’s the result. Hope you enjoy it as much as we did, and with luck, we’ll see you again before too long! The first of five tunes on this recording composed by the legendary blind Irish harper Turlough O’Carolan. Robin found it in Donal O’Sullivan’s book Carolan: The Life, Times and Music of an Irish Harper. Neither of us had ever heard it before. A lovely Welsh pipe tune that Steve learned from Anton Emery, one of his guitar students at the Swannanoa Gathering in Asheville, North Carolina. The first two tunes in this set come from Brittany, the Celtic region of western France. We learned the first (which as far as we know is untitled, as Breton tunes often are) from Bay Area multi-instrumentalist Danny Carnahan. Steve learned “Kas Ha Baarh” from the Breton group Storvan at about the same time Robin was learning it from Maryland hammer dulcimer player Maggie Sansone. Robin got “McMichen’s Reel” from a 1981 live tape of his hero Norman Blake. The McMichen in question was fiddler Clayton McMichen, one of the first American country musicians to record commercially in the 1920s. This is one of Carolan’s better known tunes, named for an English military officer stationed in Ireland. Robin starts this set with a slow air he composed at four in the morning the night before recording it. “Entre Chien et Loup” (between dog and wolf) is a French expression meaning dusk. The second tune, a traditional Irish reel, came to Steve via San Francisco fiddler Chris Knepper. A tune Steve learned from guitarist Dylan Schorer. Al Petteway joins us with some shimmering textures on the 12-string. A composition of Steve’s, named for a delicious tropical fruit. A lesser known tune of Carolan’s. Captain Sudley married Carolan’s daughter Siobhan, and Carolan celebrated the marriage with this tune, hence its alternate title. Steve learned it from Berkeley fiddler Peter Kasin. One of Carolan’s most beautiful melodies, composed for the daughter of one of his patrons. A standard Irish reel that Robin previously recorded, at a more conventional reel tempo, on his solo CD The Lightning Field. We slowed it down considerably upon the inspiration of Boston multi-instrumentalist Glen Scott.